Children and their families are very welcome at Cocochu – we are a church where being family together matters hugely to us. So every Sunday there is provision for children. This is either in the three age-specific groups or within the main service as part of all age worship. These services are created with the attention span and needs of kids fully taken into account. Creche & Bubbles is the group for 3-5 year olds, up to the end of Reception in school language, it has a selection of toys out for the younger children. Splash caters for Years 2-5, 6-10 year olds, and Xstream is for Years 6. There are facilities for parents to use with crèche aged children. Secondary school children are encouraged to come to the All age services but meet with our youth leader separately on other Sundays but not every week. They do however have a Youth group that meets on a Friday evening. 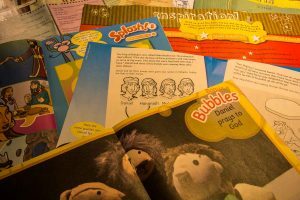 We follow the Light Curriculum from Scripture Union with our children’s groups. There is always a range of activities to help understand and remember the bible story of the week. The children come back and tell us what they have been doing at the end of the service. It’s a lot of fun and we are delighted to say that children seem to object when the family cannot make it on a Sunday. There are always healthy snacks during group time and tea and coffee after the service while parents chat and the kids have a play or leg it around!